I discovered at Women Grow a growing marijuana movement that is Black- and people of color-led, and that centers our resilience as we are fighting to end cycles of poverty and mass incarceration in our communities. 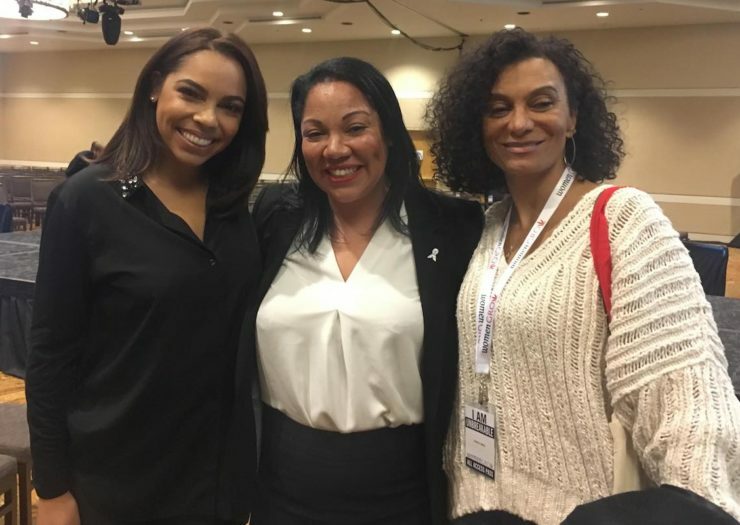 (L-R) Hope Wiseman, the youngest dispensary owner in the country, founder of Mary and Main; Dr. Chanda Macias, dispensary owner and newly appointed chair of Women Grow; and Wanda James, first Black woman dispensary owner in Colorado. Echoing Ida, a writing collective of Black women and nonbinary writers, sponsored me to attend the 2018 Women Grow Leadership Summit, held February 1-2 in Denver, Colorado. My task was to report back on how this national professional cannabis networking corporation, Women Grow, and its members addressed the intersections of race, gender, and class. This is a timely topic considering that the cannabis sector is embroiled in the landmark federal case, Washington v. Sessions, which effectively would legalize marijuana and formally define it as medicine, by removing it from the category of Schedule 1 drugs, like heroin and ecstasy, that have no accepted medical use under the 1970 Controlled Substances Act. Advocates and legal experts have linked the marijuana movement to other social justice fights for civil rights, reproductive rights, and marriage equality, arguing that they are all tied to a person’s dignity, the autonomy of the choices we make for our bodies, and the level of humanity in which our lives are protected and defended. In fact, Lauren Rudick, lead attorney in the Washington v. Sessions case and practicing attorney with Hiller, PC’s cannabis law practice, said of that case, “Cannabis is a human rights issue that is hard fought in the same ways that federal protection of abortion rights and marriage equality” have been. Meanwhile, leaders in the cannabis industry have positioned the business of selling and producing, where legal, as both beneficial for health and the economy—but those invested in racial justice rightly have asked, for whom? The questions I had hoped to address as I embarked on my trip were: Who is representing the sector? Who is positioned as credible, or a leader, and who is missing? How can the sector be proactive about investing in communities that historically have been criminalized for illegal distribution? And what I discovered at Women Grow was a growing marijuana movement that is Black- and people of color-led, and that centers our resilience as we are fighting to end cycles of poverty and mass incarceration in our communities. What started two years ago as a fangirl moment in Denver, where I was introduced to this movement, has evolved into friendships with pioneers like Wanda James, the first Black woman dispensary owner in Denver. As she invited me into the #BlackGirlMagic orbit of the marijuana movement, I connected with Oakland-based Supernova Women, and was encouraged to attend the Women Grow Leadership Summit this year. Desiree Ivey, left, cannabis nurse practitioner from Philadelphia, poses with Dasheeda Dawson of MJM Strategy. At the summit, I met and interviewed dynamic Black women leaders like Gia Morón, executive vice president of Women Grow, whose leadership has supported the visibility of women of color within the corporation’s network. I had the opportunity to connect in-person with social media friends like Dasheeda Dawson, CEO of MJM Strategy a dynamic business management executive who transferred her corporate skills “from Target to THC,” and the expert weed grower, hash producer, and cannabis lifestyle influencer The Dank Dutchess. I spoke with Takiya Anthony-Price, founder, producer, and media maker of One on One podcast, which is helping to destigmatize cannabis use among people of color. I also connected with the dynamic heads of the women of color cannabis lifestyle company EstroHaze, a multimedia company highlighting the businesses and lifestyles of multicultural women in the cannabis industry. There are also a balance of men of color in this industry like Rani Soto, COO and co-founder of New Jersey-based LeafLaunch. His eight years of experience as a financial adviser led him to building investment among Latinx millennials. He shared that his experience with older Latinos has been challenging due to the stigma attached to these communities, and religion. He believes that by leveraging the purchasing power of the Latinx community, he can transform the cannabis sector and create wealth through building opportunities within the Latinx community. Another man of color leading in the medical and adult-use marijuana movement in New Jersey is Leo Bridgewater, a retired army veteran who medicates with marijuana due to post-traumatic stress disorder (PTSD) after his return from the Gulf War. The New Jersey chapter president of Minorities for Medical Marijuana has testified before a state senate committee to expand the state’s medical marijuana program to include PTSD. Shortly after he spoke, former Gov. Chris Christie (R) signed into law a bill that did exactly that. Eventually I stumbled upon something even more sacred: the unofficial, Congressional Multicultural Marijuana Caucus, formally known as Minorities for Medical Marijuana, a collective of cannabusiness owners and advocates who are leading by providing advocacy, education, training, and outreach to underserved communities. Though they are a newly formed entity, their members were instrumental in a rapid response effort led by another people of color cannabis group, the Minority Cannabis Business Association, which challenged the Cannabis World Congress and Business Expo to uninvite Roger Stone, lobbyist and chief adviser of the 2016 Trump campaign, as a keynote speaker due to his documented racist and misogynistic comments. Dr. Chanda Macias is a dispensary owner and newly appointed chair of Women Grow. What became clearer to me as the convening progressed was that in the tradition of people who share lived experiences and pathways to liberation, the Black leaders in the cannabis sector and marijuana advocacy were no different. Though Women Grow was the convening that brought these market leaders and advocates to the space, there was much more holding them there beyond skills-sharing and networking. I was extended the generous invitation to enjoy the EstroHaze party bus, in which 15 multicultural women shared stories and dreams of growing their work in the cannabis sector. I was also invited to celebrate the birthday of Dasheeda Dawson, whose passion for this business has extended to her family. Her three sisters are now in business with her, and they are growing a family empire in honor of their late mother. These leaders and many more who attended the summit invited me to sit and be among Black leadership in the marijuana industry who are shifting narratives, setting standards for integrity and excellence, and holding the sanctity they have with each other as sacred space. These are the spaces where professionalism takes a parallel seat to building genuine connection and relationships with one another. This is where newcomers and storytellers like myself, are both extended a generous invitation to learn and at the same time are met with a healthy amount of skepticism. I understand the necessity of protecting the sacredness of an inner circle with intention and care. And I understand the importance of giving due deference and reverence to those Black and multicultural folks whose sweat equity made a way for me, and so many others, to enter the cannabis sector. These Black folks have not only made a name for themselves, but are making a way for others, without sacrificing social justice as central to their motivation and established support network. I thought I was going to Women Grow to explore the question, “How is Women Grow and its members helping to create a more inclusive industry for people of color?” What I learned from my experience is that I approached it with a misguided set of intentions. I was completely unaware of how connected folks of color already are in the sector. In retrospect, I suppose my question should have been, “Who are the Black and people of color leadership at the federal, state, and municipal space on medical and adult use marijuana, and why don’t we know about them?” Because of course we’re here, and been here, and are working to lift up our communities in innovative ways. I left the summit with a greater awareness of the ways people of color in the industry and those outside of it who are doing social justice work are aligned in centering the voices and experiences of our communities. So people who are covering the cannabis industry and its intersecting economies should learn from my experience and explore this topic with the understanding that there are people of color in leadership. Just because the cannabis leaders and investors getting media attention are not people of color, do not allow that to create a blind spot in how we tell the story of leadership in this industry and movement. Something to be learned from communities of color is borrowed from Black feminist luminary Anna Julia Cooper, who famously wrote, “when and where I enter … [my] race enters with me.” The cannabis leaders of color are modeling their passion, advocacy, investments, and expertise as a way to disrupt cycles of poverty and criminalization in our communities. Because of these people of color leaders in the cannabis sector, I am hopeful that Black feminism will take its rightful front seat at the table of marijuana legalization, and I am honored to be its faithful storyteller.